Your weather radio is like your "smoke detector." It signals to you when severe weather is in your area. This will alert you to the fact that you need to seek shelter. It provides you with a 24 hour source of weather forecasts, watches, warnings, and non-weather emergency information that is provided to you by the National Weather Service. A weather radio with S.A.M.E technology can be programmed to only alert you of hazardous conditions that affect your county. 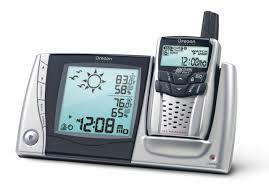 When you purchase a NOAA Weather Radio you are purchasing part of the National Weather Service Network. This radio provides you with the time you need to get your family to safety. 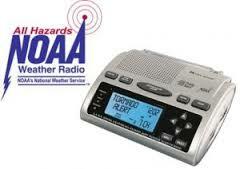 NOAA weather radios can be purchased at most electronic stores. They come in many sizes and offer many functions. The cost will vary depending on what you want in a weather radio. Most weather radios are portable battery operated or they have an AC adapter with battery back-up. When purchasing a weather radio, get one that offers S.A.M.E technology so you can program it to give you alarms for your county. The weather radio can also be adapted to meet special needs such as the hearing impaired. It can come equipped with a flashing light, a bed shaker, or a siren. NOAA All Hazards Weather Radio (NWR) is the "Voice of the NOAA's National Weather Service." NWR, a nationwide network of radio stations, broadcasts National Weather Service warnings, watches. 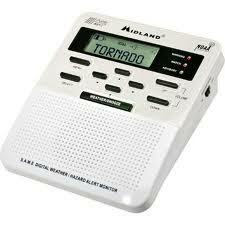 forecasts, and other hazard information out to weather radios 24 hours a day. The NWR network includes more than 1000 transmitters covering all 50 states, adjacent coastal waters, plus Puerto Rico, the U.S. Virgin Islands, and U.S. Pacific Territories. NWR's broadcasts can be picked up only by weather alert radios or scanners with the capability to receive its VHF signal. Every year, the National Weather Service collects some 76 billion observations and issues approximately 1.5 million forecasts and 50,000 warnings. Weather radio transmitters are located in all 50 states. There are more transmitters located in Texas than in any other state. Over 98% of the U.S. population lives in areas covered by NOAA Weather Radio broadcasts. Cooperating with Homeland Security, Federal, State, and Local Emergency Managers and other public officials, NWR can broadcast warning and post-event inforamtion for all types of situations including AMBER alerts, civil emergencies, and nuclear or radiological hazards. The voices heard on NOAA Weather Radio aren't human, but they do have names. Tom and Donna are the English voices' names, and Javier is the Spanish voice. All three voices are produced using the Speechify text-to-speech system, which was implemented during the 1990's system upgrade. The original computerized voice was called Paul, which was retired in the 90's.